Mats in cat fur are not only unsightly, they are also painful to your cat. They can lead to skin irritation and infection if they're not removed. De-matting a cat is generally not a fun experience for the feline or the human. Expect to take it slow, and don't be surprised if you don't get all the mats out in one sitting. You may want to enlist the help of an assistant. Here's the easiest and least painful way to get rid of mats, but be forewarned it will take a lot of patience. 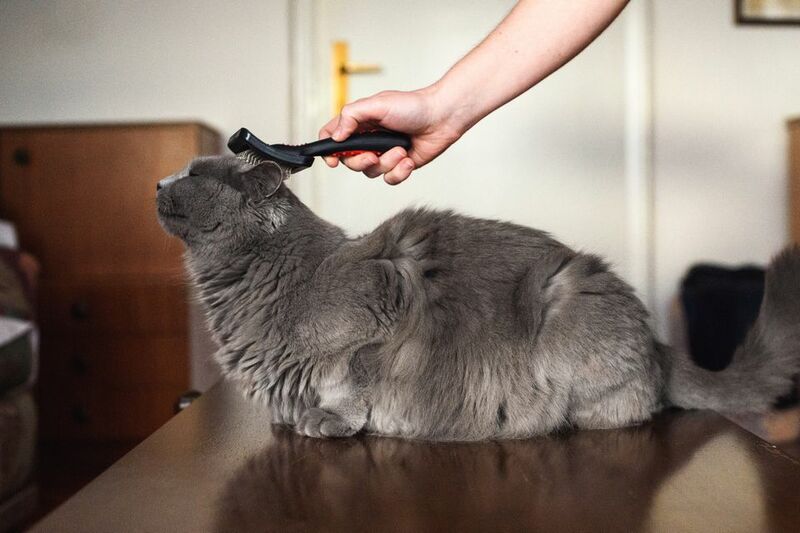 Most cats groom nearly constantly (or so it seems), and it's not just due to vanity. Licking its fur keeps a cat's skin healthy and stimulates the sebaceous glands, which produce oil to lubricate the fur. Usually, grooming keeps the fur clean and prevents fleas from taking hold. But sometimes, if a cat gets something stuck in its fur or neglects its grooming, mats may form. These clumps of fur can be painful for the cat, who may try to lick or bite at them. If your cat has stopped grooming altogether, this could be a sign something serious is wrong, and a trip to the veterinarian is in order. But if there are just a few spots of stubborn matted fur, you should be able to take care of them at home. Removing mats from cats takes a steady hand, a lot of patience and sometimes more than one person, to keep the cat calm. Start with a relaxed cat. Don't suddenly decide to remove a mat in the middle of a play session, or you'll suffer serious damage from claws. Sprinkle a little cornstarch or talcum powder in the area of the mat, and gently work it around with your fingers. Gently pull the mat up away from the skin, so you can see where the skin is. If the cat resists, take a break and speak in a soothing voice, petting the cat until it relaxes (you can repeat that step at any point during the procedure if your cat starts getting stressed out). Using sharp blunt-nosed scissors, carefully slide the scissors along the skin into the mat, holding them perpendicular to the skin, i.e., the bottom blade slides along the skin. Cut up, into the mat. Make a clean cut and try not to pull the hair while cutting. Give your kitty a small treat and praise it for its patience. Move the scissors over half an inch or so and cut again. You should be able to start working the separated mats apart with your fingers now, and loose pieces will easily pull away. Starting with a separated section of the mat, use your left hand to hold the base of the mat down with thumb and forefinger, so the comb won't pull hair out. With short-haired cats, a small slicker brush may be used next to slowly and gently brush through any remaining tangles. Give your cat another treat and stop for the day. Depending on how seriously matted it is, it may take several days to tackle them all, and you need its cooperation and patience, so don't push it all at once. Never bathe a cat before removing mats. You'll only have worse problems on your hands. For small tangles that haven't yet formed 'felt', try spraying with a hair conditioner before combing. Be sure to use a pump-type spray rather than aerosol, which will scare your cat. This tedious procedure will almost always work better if you have a helper to hold and comfort the cat while you work. Seriously matted cats may have to be shaved by your veterinarian or groomer. If this drastic step is necessary, be sure to maintain a regular program of brushing and combing when the coat grows back, to prevent future problems.